Centre tape / 4 wire potentiometerwith power rating 3 watt for joystic control application or similar application. Potentiometer V.R-3CT is a panel setting device for a maximum wattage ratting upto 3 watt with Center tape. V.R.-3CT is also known as 4 wire potentiometer. V.R.-3CT is mainly useful for differential end input (+/- Voltage) to the system. 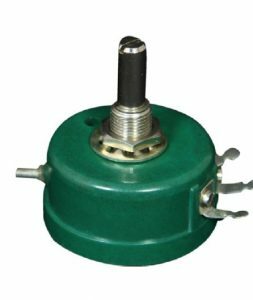 Even it is a ideal potentiometer for Joystick application. V.R-3CT has been specifically designed to have longer life, No discontinuity and smooth movement of shaft. It has a feasibility to customize in several ways. Such as shaft modification, lug terminal arrangement, a vast range of ohmic value from 10 ohms to 100k ohms. 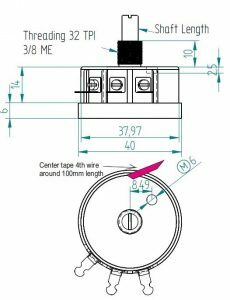 The capability of the company to produce a vast range of potentiometer is a USP on its own. The Product can be made to Ingress protection upto IP65 and above on request. For best performance of V.R-3CT below points needs to be taken into consideration. 2) V.R-3CT should be mounted with Star washer given along with the product and perpendicularity between the panel and axis of potentiometer should be maintained. 3) For applications with extreme vibration please use lock nut assembly which is being supplied on the demand. Ordering Information- V.R-3CT - Resistance Value - Shaft length - Any specific Info. Spindle Material Brass (standard). S.S on request. Rotational Life expectancy 50,000 cycles. Total resistance tolerance +/-10% (Standard) +/- 5% or +/-2% available on request.